Did you know that up to 45% of your home's energy loss is lost through the ceiling? That's why it's so important to insulate your floors and ceiling. Properly insulated floors and ceilings can serve as a soundproofing, reduce the workload on your heating and cooling system and help reduce your utility bills. In the winter months the heat from your furnace will escape through your ceiling and in the summer an under-insulated ceiling will provide little protection from the outside elements. Anytime you add insulation to your home you will be making it more energy efficient but adding insulation to your floor or ceiling can also be a great way to make your home more comfortable and less drafty. Obviously the best time to insulate your floor or ceiling is when your home is being built but the job can be done after the builders are long gone. Post construction applications are actually quite common and are less expensive & intrusive then you might think. Loose fill insulation can pumped into your floors or ceilings by cutting small access holes. With a little bit of drywall patch and some touch up paint you won't even notice them. What you will notice is the increased comfort level in your newly insulated space and the money you saved from making your home more energy efficient. 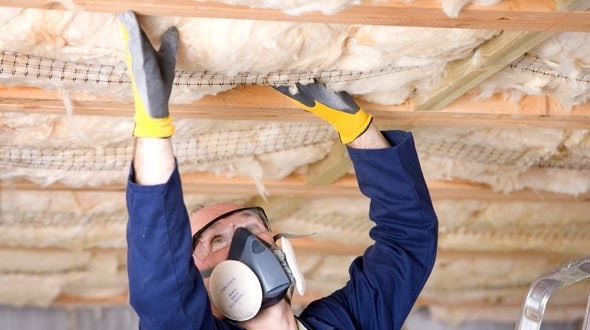 A BPI certified contractor can evaluate your homes current insulation needs and make common sense recommendation on how to improve your homes overall energy efficiency. If your thinking about adding insulation to your floors or ceiling you should contact a certified insulation contractor near you for a free in assessment. They have the knowledge and expertise to help you get the best return on your insulation investment.